Oileán in aice le cósta thoir theas na Síne is ea an Téaváin, nó Formósa, mar a thugadh na Portaingéalaigh air fadó - "oileán álainn" is brí le ilha formosa na Portaingéilise. Tá Oileán na Téaváine 394 chiliméadar ar fad agus 144 chiliméadar ar leithead, agus é scartha ó mhórthír na Síne ag Caolas na Téaváine, 180 ciliméadar ar leithead. De réir fortheilgean bhliantúil oifigiúil, bhí 23,374,274 duine ina gcónaí ar an oileán ar 18 mí Iúil 2018. Tá oileáin mhóra na Seapáine suite soir ó thuaidh ón Téaváin. Ag dul soir ón Téaváin, tiocfaidh muid ar Oileáin Ryukyu, ar cuid den tSeapáin iad chomh maith. Na hOileáin Fhilipíneacha, arís, tá siad laisteas den Téaváin. Is é stádas polaitiúil na Téaváine inniu ná gurb ionann an t-oileán (in éineacht le roinnt oileán beag ina timpeall) agus Poblacht na Síne, poblacht a mhaíonn gurb í an t-oidhre ceart don stát a bhí ag rialú na Síne sular bhuaigh na Cumannaigh an cogadh cathartha sa bhliain 1949. Maidir le rialtas Dhaonphoblacht na Síne ar an mórthír, áfach, is é a dtuiscint ar an scéal nach bhfuil sa Téaváin ach cúige de chuid na Síne a bhfuil lucht ceannairce ina sheilbh. Ní hionann, go beacht, an Téaváin agus Poblacht na Síne, nó tá an Phoblacht sin i seilbh roinnt oileán beag timpeall na Téaváine, go háirithe Oileáin Penghu, nó na Pescadores ("Oileáin na nIascairí"), mar a thug na Portaingéalaigh orthu. Thairis sin, baineann an tOileán Glas nó Lü Dao agus Oileán na Magairlíní nó Lan Yu leis an Téaváin. Tá sé ina chnámh mhór spairne i bpolaitíocht na Téaváine, cé acu ba chóir don oileán an ficsean oifigiúil faoi "Phoblacht na Síne" a choinneáil i bhfeidhm nó poblacht neamhspleách ar leith a ghairm den Téaváin. Iontas na n-iontas, tá rialtas na Daonphoblachta níos sásta leis na cúrsaí mar atá siad. Is fearr leosan na Téavánaigh a bheith ag dearcadh orthu féin mar "chineál" Sínigh, ná ag dul le náisiúntacht ar leith, agus dá bhfógródh an Téaváin neamhspleáchas mar Phoblacht na Téaváine, thabharfadh arm na Síne Cumannaí ionsaí ar an oileán ar an toirt, mar is eagal le muintir na Téaváine. Is í an tSínis an teanga is mó a labhraítear sa Téaváin inniu, ach ar ndóigh, ní aon teanga amháin í. Úsáideann na Téavánaigh leagan den Mhandairínis mar theanga chaighdeánach, cosúil le muintir na mórthíre, ach ní bhíonn an Mhandairínis ó dhúchas acu. An chuid is mó acu, labhraíonn siad an teanga ar a dtugtar "Téaváinis" (a dtugtar Hoclais na Téaváine uirthi chomh maith) go minic. Leagan den chanúint Min Nan atá ann go bunúsach - canúint a labhraítear i ndeisceart Chúige Fujian sa mhórthír freisin. Is minic a dhearctar ar chainteoirí na canúna seo mar ghrúpa eitneach ar leith, dream ar a dtugtar Hoklo. Thairis sin, tá an chanúint Hakka ag mionlach mór de na Téavánaigh, canúint a bhíonn á labhairt i bpobail bheaga scartha ar fud dheisceart na Síne. Labhraítear teangacha Formósacha sa Téaváin chomh maith - teangacha beaga a bhfuil gaol acu leis na teangacha Malae-Pholainéiseacha, cosúil leis an Tagálaigis, an Indinéisis, an Mhalaeis agus an Mhaorais, mar shampla. Tá na teangacha Formósacha ag géilleadh don tSínis go géar gasta, áfach, agus cé go bhfuil rialtas na Téaváine ag iarraidh iad a athbheochan sna scoileanna inniu, ní féidir mórán athrú a aithint ar an gcuma atá ar an scéal. Is é is cúis leis an "neamhspleáchas" de facto atá ag an Téaváin inniu ná gur éalaigh cinnirí Pháirtí Náisiúnta na Síne, nó Guomindang, ón mórthír go dtí an t-oileán nuair a bhris na Cumannaigh an cogadh cathartha orthu sa bhliain 1949. 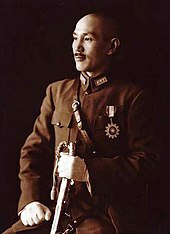 Ba é cinnire finscéalach Guomindang, Chiang Kai-shek (Jiang Jieshi), a bhí i gceannas orthu. Ina dhiaidh sin, ba é an páirtí sin a bhí ag rialú na Téaváine le lámh láidir - deachtóireacht aon pháirtí a bhí ann, cosúil leis an tSín Chumannach sa mhórthír, ach le fírinne is leis na deachtóireachtaí i Meiriceá Laidineach is fearr í a chur i gcomparáid. Bhí an dlí míleata i bhfeidhm ar an tír, agus na cearta daonna faoi leatrom. Thairis sin, ní raibh lucht leanúna Guomindang in ann airgead an stáit agus airgead an pháirtí a aithint thar a chéile. D'imigh sin, áfach, agus tháinig seo. Thart ar lár na n-ochtóidí, thosaigh an tUachtarán Chiang Ching-kuo - mac Chiang Kai-shek - leasuithe daonlathacha a chur i bhfeidhm, agus cheap sé Lee Teng-hui mar leas-Uachtarán. Téavánach go smior a bhí i Lee - is é sin, níor tháinig a mhuintir go dtí an t-oileán sa bhliain 1949. Comhartha eile daonlathais a bhí ann, nó bhí na Téavánaigh go mór faoi leatrom ina dtír féin ag deachtóireacht Guomindang. Sa bhliain 1987, bunaíodh an chéad pháirtí eile seachas Guomindang - an Páirtí Daonlathach Forásach. De thoradh na staire seo, is í an deighilt is tábhachtaí i bpolaitíocht an oileáin inniu ná an teannas idir an campa "gorm" (Guomindang agus na páirtithe a thacaíonn leis) agus an campa "uaine" (na Daonlathaigh Fhorásacha agus na páirtithe a thacaíonn leo). Cuireann an campa gorm béim ar an uile-Shíneachas, ar an Mandairínis, ar an t-aon chultúr Síneach amháin, agus é ag dréim le hathaontú na Síne - is é sin, aontú na Téaváine leis an gcuid eile den tSín. Is é an campa uaine a gcampa siúd a dteastaíonn uathu neamhspleáchas de jure a bhaint amach don Téaváin, agus cuireann siad béim ar chultúr an oileáin féin agus ar an Téaváinis mar theanga ar leith. Tá áitreabh daonna éigin sa Téaváin le tríocha éigin míle bliain anuas, ach níor tháinig sinsir na "mbundúchasach" Téavánach (is é sin, a sinsir siúd a labhraíonn na teangacha Formósacha) go dtí an t-oileán ach timpeall ar cheithre mhíle bliain ó shin. Níor thosaigh na Sínigh ag cur fúthu san oileán roimh an 15ú haois AD, agus le fírinne, ba iad na hEorpaigh a chuidigh leis na Sínigh an Téaváin a mhíntíriú. Ba iad na Portaingéalaigh a bhaist an t-ainm Formósa ar an oileán sa bhliain 1544, ach ba iad na hOllannaigh ba thúisce a bhunaigh stáisiún trádála sa Téaváin, sa bhliain 1624. Thosaigh siad ag iompórtáil lucht oibre ó mhórthír na Síne, agus chuir a lán de na hoibrithe seo fúthu ansin go seasta. Go gairid ina dhiaidh sin, chuaigh na Spáinnigh i dtír i dtuaisceart an oileáin, agus d'fhorghabh siad an chuid den oileán ina bhfuil cathair Keelung inniu. Sa bhliain 1642, áfach, chuir na hOllannaigh agus a gcuid comhghuaillithe dúchasacha ruaigeadh ar na Spáinnigh as an oileán. B'éigean do na hOllannaigh glanadh amach leo sa bhliain 1662, nuair a d'fhorghabh an t-aimiréal Síneach Koxinga é. San am seo, bhí na Manchúraigh díreach ag cur deiridh le rítheaghlach Ming sa tSín, agus theastaigh ó Koxinga bunáit a chur ar bun sa Téaváin do lucht leanúna Ming. D'éirigh leis na Manchúraigh, áfach, oidhre deireanach an rítheaghlaigh a mharú. Mar sin, níor fhéad Koxinga ach stát neamhspleách a dhéanamh den Téaváin - Ríocht Tungning, mar a thugtaí air. Fuair Koxinga bás go gairid tar éis dó an stát a bhunú, ach mhair an ríocht go dtí an bhliain 1683, nuair a tháinig an t-Aimiréal Shi Lang ó Dheisceart Fujian le cabhlach mór cogaidh chun an t-oileán a ghabháil don tSín, a bhí á rialú ag rítheaghlach Manchúrach Qing anois. Ina dhiaidh sin féin, mhair na húdaráis Shíneacha go ceann i bhfad ag iarraidh na bundúchasaigh agus na foghlaithe mara san oileán a chloí, agus na Sínigh ón mórthír ag tonnadh isteach le cur fúthu sa Téaváin. Cosúil leis na hIndiaigh san Iarthar Fiáin bhí na bundúchasaigh ag cur ar a son in aghaidh na muintire isteach, agus bhí cathanna móra ann. Sna blianta 1894-5 bhí cogadh á chur idir an Fhrainc agus an tSín, agus cathanna á gcur in Oileáin Penghu agus i dtuaisceart na Téaváine. D'fhorghabh na Francaigh Keelung, baile cuain Taipei, ar an 1 Meán Fómhair 1894, ach cúpla lá ina dhiaidh sin briseadh cath mór orthu in Tamsui. Bhí na Francaigh in ann roinnt cathanna a bhuachan fós, ach mar a d'iompaigh na cúrsaí amach ní raibh rath i ndán dá bhfeachtas timpeall Keelung, agus sa deireadh b'éigean dóibh glanadh leo as Keelung agus Oileáin Penghu. Sa bhliain 1885 rinneadh cúige inti féin den Téaváin - roimhe sin, ní raibh inti ach cuid de chúige Fujian. Sna sálaí ag an athrú stádais seo tháinig oibreacha móra forbartha, agus cuma nua-aimseartha á cur ar an Téaváin. Cuireadh seirbhísí poist ar bun san oileán, agus gearradh an chéad iarnród chomh maith. Sna blianta 1894-5, áfach, chuir an tSín agus an tSeapáin cogadh ar a chéile, agus ba é toradh an chogaidh go ndeachaigh an Téaváin agus oileáin Penghu ó lámh na Síne go lámh na Seapáine. Iad siúd sa Téaváin ar rogha leo fanacht ina ngéillsinigh Shíneacha fágadh spás dhá bhliain acu lena gcuid maoine saolta san oileáin a dhíol agus cur fúthu ar an mórthír. Ní mó ná sásta a bhí na Téavánaigh leis an gconradh síochána seo - Conradh Shimonoseki - agus ar an 25 Bealtaine 1895, d'fhógair dornán státseirbhíseach ardchéimíochta Síneacha poblacht den Téaváin le muintir an oileáin a spreagadh chun frithbheartaíochta in aghaidh na Seapánach. Chuir na Seapánaigh ceannairc na "bpoblachtánach" faoi chois le lámh láidir, agus níor mhair an phoblacht oiread is leathbhliain, nó tháinig deireadh léi i Mí Dheireadh Fómhair na bliana céanna. Ní raibh poblacht cheart ann ach an oiread: na státseirbhísigh a bhunaigh í, bhí siad ag iarraidh cumhacht Impire na Síne a athbhunú san oileán seachas neamhspleáchas a bhaint amach don Téaváin. Bhí na Seapánaigh ag caitheamh go garbh gairgeach le muintir na Téaváine idir Shínigh agus bhundúchasaigh, ach ón taobh eile de ní féidir a rá gur tíorántacht gan mhaith a bhí idir lámhaibh acu. A mhalairt ar fad rinne siad a lán leis an oileán a thabhairt chun nua-aimsearthachta. Ghearr siad tuilleadh iarnród agus bóithre, agus d'fhorbair siad an córas scolaíochta. Chuir na Seapánaigh deireadh le sealgaireacht na gceann san oileán freisin. Bhí tionscal na ríse agus an tsiúcra ag dul i méadaíocht, agus sa bhliain 1939 bhí an Téaváin ar an seachtú táirgeoir siúcra ba mhó ar an domhan. San am chéanna bhí na Seapánaigh ag cogaíocht go brúidiúil le frithbheartaíocht mhuintir an oileáin a chloí. Ar dtús ba iad na treallchogaithe Síneacha a bhí á dtroid acu, agus ina dhiaidh sin, chrom siad ar na bundúchasaigh sna sléibhte a thabhairt chun síochána. Ba é ceannairc na treibhe úd Seediq i Wushe an teagmháil ab fhuiltí idir na Seapánaigh agus na Téavánaigh dhúchasacha. Mharaigh na Seediq 130 Seapánach i sráidbhaile Wushe ar an 27 Deireadh Fómhair 1930, agus maraíodh breis is míle Seediq nuair a tháinig na saighdiúirí Seapánacha ag imirt díoltais ar an treibh. Timpeall na bliana 1935 thosaigh na Seapánaigh ag tabhairt mhuintir na háite chun Seapánachais: chaithfidís cuma na Seapáinise a chur ar a gcuid ainmneacha agus Seapáinis a fhoghlaim is a labhairt le chéile, oiread agus ab fhéidir. Nuair a thosaigh an Dara Cogadh Domhanda, chuaigh fiche míle Téavánach sna saighdiúirí i bhfórsaí armtha na Seapáine. Mar shampla, bhí deartháir le Lee Teng-hui (polaiteoir Téavánach arbh é Uachtarán na Téaváine é sna blianta 1988-2000) ina shaighdiúir Seapánach le linn an chogaidh, agus fuair sé bás i bpáirc an áir sna hOileáin Fhilipíneacha. Bhaineadh Cabhlach Impiriúil na Seapáine an-leas as cuanta na Téaváine, agus bhí meitheal smaointe impiriúlachais an Chabhlaigh, "Grúpa an Bhuille Theas", lonnaithe in Ollscoil Impiriúil Taihoku in Taipei. I Mí Dheireadh Fómhair na bliana 1944 cuireadh mór-aerchath ar fud chóstaí thoir na Téaváine, Oileáin Ryukyu, agus Okinawa, idir na Meiriceánaigh agus na Seapánaigh, agus na haerdhíormaí Seapánacha a throid sa chath seo bhí siad lonnaithe sa Téaváin, an chuid is mó acu. Bhíodh na Meiriceánaigh ag buamáil na Téaváine freisin, ó bhí bunáiteanna míleata agus gléasraí tionsclaíochta de chuid na Seapánach san oileán. Ar an 25 Deireadh Fómhair 1945 thug Cabhlach na Stát Aontaithe isteach trúpaí míleata Síneacha - is é sin, trúpaí de chuid Phoblacht na Síne - go Taipei (nó Taihoku, mar a thugadh na Seapánaigh ar an áit) le go bhféadfaidís glacadh le géilleadh na Seapáine go hoifigiúil ansin. Shínigh an Ginearál Rikichi Ando, a bhí i gceannas ar na fórsaí armtha Seapánacha san oileán agus a raibh freagracht air as riarachán uile an oileáin mar Ghobharnóir Ginearáil, shínigh sé an conradh ar a dtugtar an Ionstraim um Ghéilleadh na Seapáine. Ansin, chuaigh an t-údarás ab airde sa Téaváin ó lámh Ando go lámh an Ghinearáil Chen Yi. D'fhógair Chen Yi gurbh é sin Lá Athbhronnta na Téaváine, ach ba é an tátal na gComhghuaillithe go raibh an Téaváin agus Oileáin Penghu faoi fhorlámhas na Seapáine i gcónaí, cé go raibh na hoileáin forghafa go míleata ag na Sínigh. Níor athraigh an dearcadh ach sa bhliain 1953. Tháinig sé chun solais go luath nach raibh muintir dhúchasach na Téaváine róshásta leis na míleataigh Shíneacha ón mórthír. Thairis sin, ní raibh róchuma ar na cúrsaí eacnamaíochta, agus na praghsanna ag dul i méadaíocht go géar gasta. Chaill rialtas Chen Yi gnaoi an phobail go sciobtha, agus i ndeireadh Mhí Feabhra 1947, d'éirigh ina chogadh dearg idir bunadh na Téaváine agus na saighdiúirí. Tháinig saighdiúirí ag coigistiú a cuid coigiltis ó sheanbhean a shaothraigh a cuid ag smuigleáil toitíní, agus chruinnigh na sluaite timpeall na háite ag caitheamh anuas ar na saighdiúirí. Ansin scaoil duine de na saighdiúirí urchar le rabhadh a thabhairt don tslua, ach má scaoil, mharaigh a philéar duine dá raibh i láthair, rud a chuir muintir na Téaváine ar an daoraí ar fad. D'éirigh bunadh an oileáin in aghaidh na Síneach ón mórthír, ach má d'éirigh, ní raibh lucht na mórthíre i bhfad ag cur na ceannairce seo faoi chois. Maraíodh na mílte Téavánaigh, idir ghnáthcheannairceoirí agus lucht scothaicme. Sa bhliain 1949, fuair na Cumannaigh an lámh in uachtar ar an mórthír, agus b'éigean do Chiang Kai-shek agus lucht a leanúna glanadh leo go dtí an Téaváin i ndeireadh na bliana céanna. Shocraigh dhá mhilliún duine ar fad de lucht leanúna Chiang fúthu san oileán. Chuir Chiang dlí an chogaidh i bhfeidhm ar an oileán, agus níor cuireadh an dlí sin as feidhm ach sa bhliain 1987. Idir an dá linn, áfach, baineadh úsáid fhairsing as na cumhachtaí éigeandála a bhronn an dlí ar na húdaráis, agus is iomaí easaontóirí a cuireadh chun báis nó a caitheadh i dtóin phríosúin. Ba í bagairt an Chumannachais an tsiocair leis an sceimhle seo, mar ba ghnách i ré an Chogaidh Fhuair. Is síol faoi thíreolaíocht na Téaváine (DPS) é an t-alt seo. Cuir leis, chun cuidiú leis an Vicipéid.